The Alexandra protest has shown that the DA might not possess the skills and attention it needs to lead, writes Ferial Haffajee. I love Joburg’s public pools and the one in Mayfair has particularly happy memories for me. After moving out of Bosmont in the west of the city, we moved to Mayfair as the Group Areas Act’s grip was loosened after decades of activism. This former white suburb built for railway workers abutting Fordsburg was a hotbed of resistance and activism. The political who’s who of the ANC and other liberation movements called it home for a time in the 1980s before they moved on to suburbs as freedom extended her reign. As working class stock, we stayed. My dad and I loved the big blue Art Deco pool with its surrounding lawn and we would spend large chunks of the long Joburg summer swimming there. In March, the DA broke my heart. The area’s local councillor, Alex Christians, who was parachuted into the area from Durban by the party that says it does not believe in cadre deployment, presided over a disappointing meeting. The upshot of it was that the pool would be mothballed; crudely bricked up and balled in a barbed-wire fence, although the community stated its clear preference for it to be fixed to meet any of the many needs of this enclave that at least 34 different nationalities call home. It is also one of the few parts of South Africa that are genuinely integrated by class and race. The day the news was broken to us was beautiful and warm, and children romped on the lawns, screaming with joy as the community screamed in frustration at Christians, who is facing a federal investigation by the party for influence peddling in the suburb. At the pool, he was trying a similar stunt to the one that got him into trouble in the first place – his habit now is to outsource public goods to private interests. In the first case against him, a local sports centre was rented to a private school without procedures being put in place. This time, again, he was using his base of Somalian traders who want the pool complex to be run as a private school. Local activists call it “micro state capture”, where private interests get public goods for personal gain. In Cape Town, activists in the Reclaim the City movement have noted the same patterns of arrogating public goods to private money. The Mayfair pool has been vandalised by the area’s large homeless community who have stripped it and run because the council removed security. The pool pump room is now a motley set of pipes that couldn’t be removed; everything that could be taken is gone. The sparkling blue pool is now a puddle of green slime and the kids played soccer in the parts of the pool that had been drained. The changing room that I had eagerly rushed into to get into my costume was an abandoned husk. The lifeguard’s viewing hut from which we were watched like sentinels for our safety was glassless and eerie, a relic of a time when there were still public recreational services for poor citizens. This is the DA’s story in Ward 58, which covers about seven suburbs including Mayfair, Fordsburg and Langlaagte – where gold was first mined and which is an intrinsic part of Joburg’s story. The entire ward is in a state of extreme failure. By all metrics of local government, the DA has failed an area that turned its back on the ANC, which had considered the area a stronghold because of its political history. 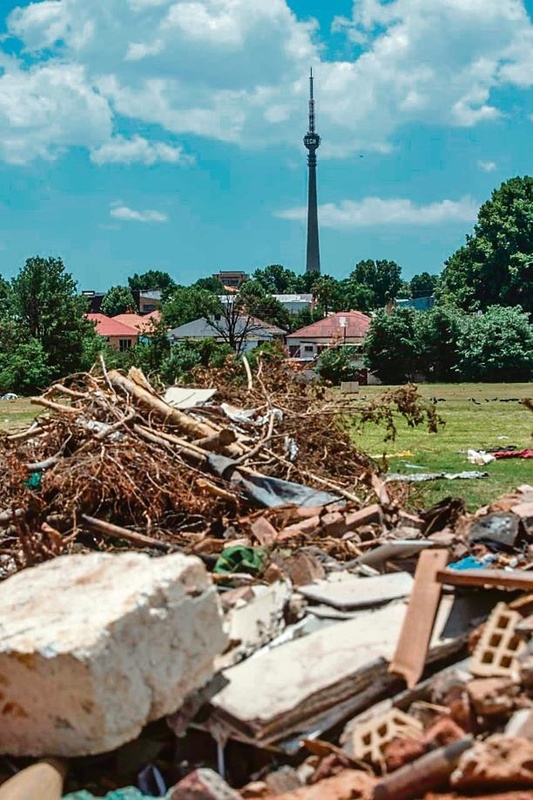 In the past three months, heightened community activism has seen more effort put into the area, but, as Alexandra burnt last week as the community rose against the DA local government, it resonated with us in Ward 58. The scale of the city and the depth of its challenges requires skills and attention that I am not sure the DA possesses, although the party has made the mantra of good governance its key manifesto promise. The pledge is that, where the DA governs, life is better. That has not been my experience in Mayfair, although it is so in Parkhurst, my other home. There, the councillor is a dream. Tim Truluck is the living embodiment of the community councillor. He rides around on his scooter spotting street lights that are out and taking down posters that offend by-laws. He is the interface between council bureaucracy and service delivery. Truluck holds regular meetings, he runs a cool newsletter so you know what’s what in your area and he secures resources for his ward. Christians doesn’t live in Ward 58, he does not visit often and, most problematically, he doesn’t appear to care. This is a problem for the DA – its governance promise and premise only truly work in its traditional (white) strongholds, which have always enjoyed favoured governing status. My experience is that the party has not learnt to govern in black areas, where the problems are deeper – like Alexandra, like Ward 58 and like Johannesburg’s inner city. Take the pool story – because I am a public pool boffin, I have followed how the party has rebuilt and fixed pools across the country where it governs. Why is our pool different and why are standards of governance so different here from other areas where the party does well? There is a clear and verifiable double standard in our experience. The ANC turned Alexandra into a whipping horse for the DA as its cadres executed a #TotalShutdown last week because it is in a state of collapse. Despite the billions of rands poured into Alex since 1994, it is still a mess and the two parties must take proportionate responsibility. The roads are pot-holed and the services are sketchy; electricity connections dangle dangerously across roads and loop through the mix of formal, old houses and informal homes. In almost three years, the DA has not made a significant mark of improvement to things within its control such as refuse removal, roads, housing and storm-water drainage. Local government has significant authority and funding and, in any country, two and a half years is a fair point at which to measure political progress. In fact, as Carte Blanche showed on Sunday when it aired tape of a senior Johannesburg Roads Agency boss arranging a bribe, the party is as susceptible to looting and patronage as the governing party is. For a profile I am writing on the DA’s Gauteng premier candidate Solly Msimanga, I followed him in Yeoville, Johannesburg, last week. At the police station, the DA was conducting an oversight visit because their members complain the cops arrest foreign residents and then fleece them for bribes before releasing them and re-arresting them for another bribe. It’s quite a racket and the DA is on to it. The party is a good opposition and its method of using the courts to secure greater transparency and good governance during the kleptocracy of former president Jacob Zuma was a masterstroke. Its police station visits, pioneered by national MP Zak Mbhele, are excellent examples of opposition activism. But outside the Yeoville Police Station, the roads are rutted, trash lies in steaming piles, and that which is in the control and power of the DA has clearly not been attended to. Msimanga tried valiantly to explain what we were seeing was the outcome of overcrowding and of people who do not want to register with the council to receive a wheelie bin. But by-law enforcement is a municipal competence and the DA has failed dismally at this in the inner city, other than for election blitzes made for media. In its suburban strongholds, by-laws are meticulously enforced, again raising the spectre of a governance double standard. The DA launched its campaign first when it held a mini-manifesto launch in Johannesburg’s Mary Fitzgerald Square last year. As DA leader Mmusi Maimane was escorted on to the stage through the crowd to speak about the campaign message of good governance and building “one South Africa for all”, it was clear the party was planning a positive campaign. But as its governance gaps have come back to bite it, the party has gone back into negative campaigning. By Thursday, Msimanga was burning Sanral’s e-tolls statements – a few days after the party wrote to Moody’s Investors Service to ask why it had not made a ratings decision on whether or not South Africa’s debt would be made “junk”. For me, it felt as if the DA that is predicted by pollsters to be unlikely to make its key campaign aim of taking three provinces was retreating into its role as an official opposition instead of a party of government. When I looked at the Mayfair pool, I could understand why. Do you think the DA has the ability and capacity to lead SA?